"Black Dog" And "Ruby" Add Even More Luxury To Lifestyle C.C. If you knew Paul Baltierra of Los Angeles, California, and Audie Munoz of West Covina, California, you’d know that they’re all heart for their club, Lifestyle C.C. Both of these guys are die-hards and have helped older club members come back by inspiring them to build another car. Some people call it a brotherhood, others call it family; whatever the case, we thought that we would bring you a pair of Lincolns that complement one another nicely. 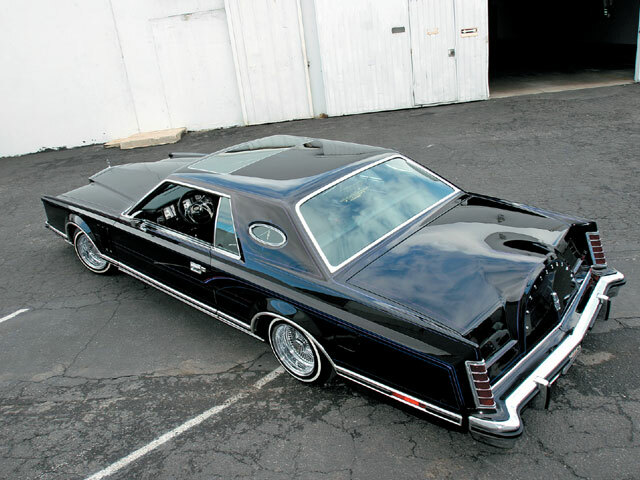 Paul’s ’79 Lincoln Mark V is dubbed “Black Dog” and it’s always ready to roll. Paul purchased his cruiser from an old friend and fellow Lifestyle member for $3,000. Paul began going through the car, which was in decent shape and had only 40,000 original miles on the odometer. Richard of Evergreen Hydraulics agreed to take on the task of redoing the existing setup. 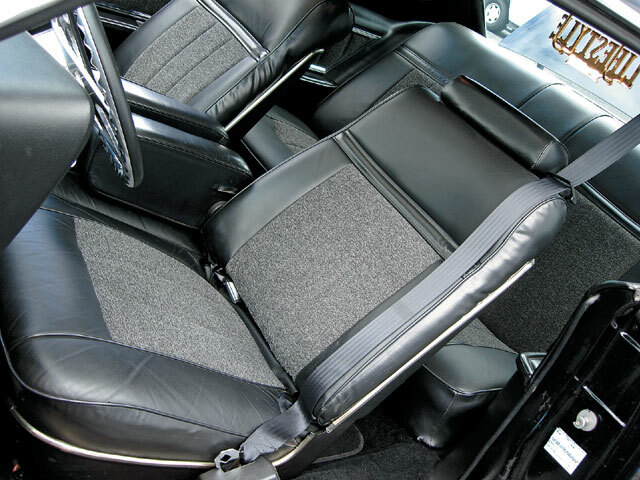 See this month’s “Bumps & Dumps” section for the full story on the trunk compartment. Paul was then ready to hit the road with his homeboys as his car was lifted, painted and sporting a new set of Premium Sportway 5.20s for the strip. Audie Munoz is no stranger to the magazine as he’s had his beautiful ’65 Buick Riviera, “She Devil,” featured in the past. 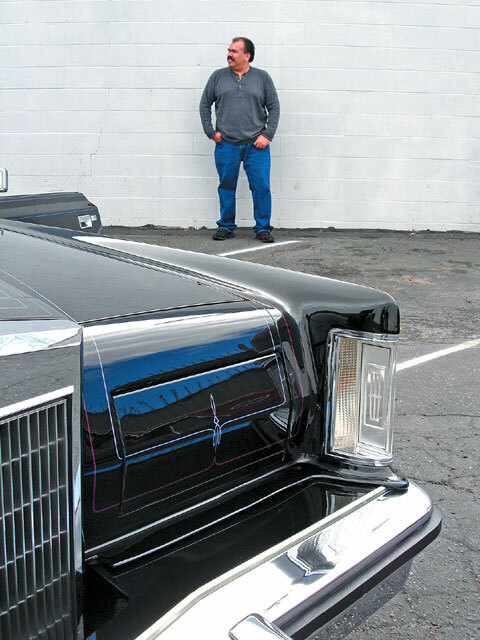 This time, Audie tried his luck with his ’79 Diamond Jubilee Edition Lincoln. Audie acquired the Mark V as a second club car while he took his Rivi to the next level. This Lincoln was originally going to be built as a tribute to Joe Ray’s “Dressed To Kill,” the red version of the now famous “Las Vegas” car. 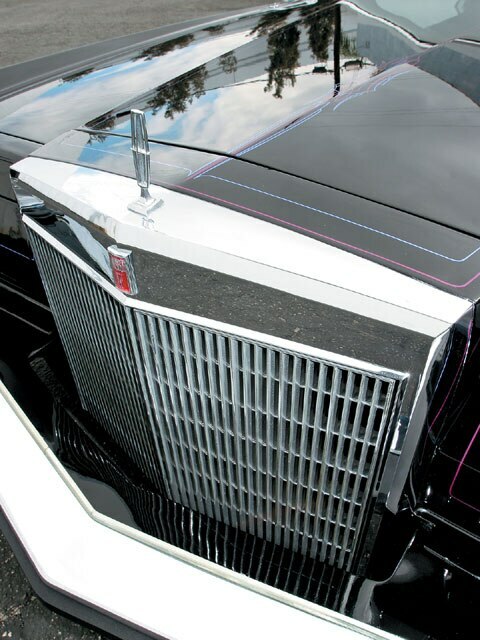 Now that’s not a typo, the Lincoln was also named Dressed To Kill just like Joe’s famous Riviera of the same name. 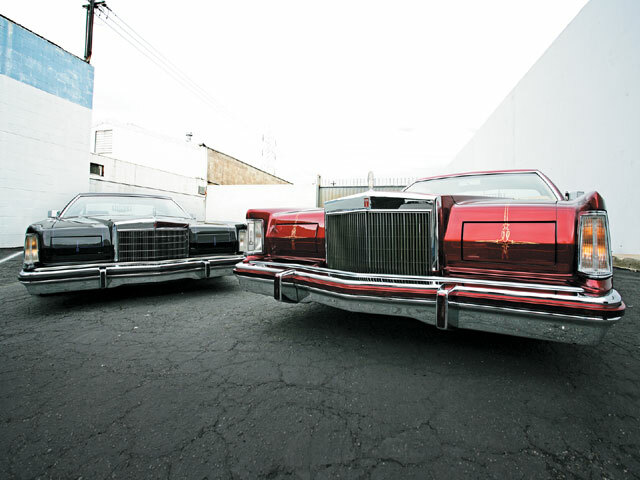 The Lincoln was owned by Oishi of House of Lowriders, who was going to build it as a Lifestyle C.C. theme car. 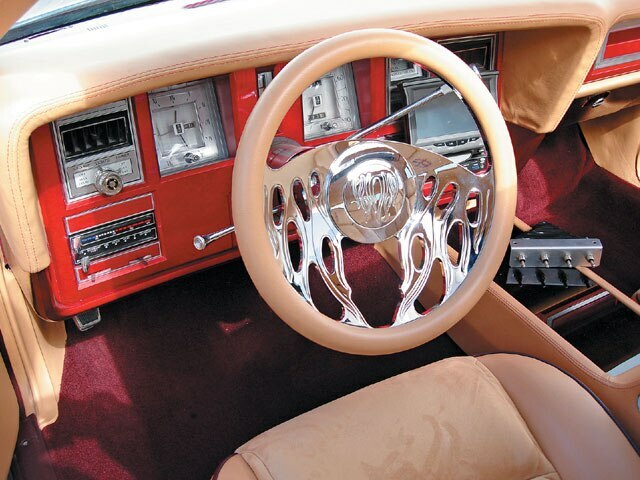 Oishi started by taking the car to Gary Baca of Van Nuys, California, who shaved the door handles and emblems. He then broke out some of his famous secret dyes and mixed up the custom red paint that was sprayed on the original Lincoln. The car was left at Oishi’s while parts were tracked down for it. After getting a call that the partially completed car was for sale, Audie jumped on the deal. All he had to do was finish putting it together. Audie spoke to Oishi, made some arrangements and began bringing the car home in several trips. All he brought home on the first trip was the rolling shell. The next few trips were needed to bring home all of the NOS parts that were purchased for the car, which had only had around 50,000 miles on it. After sorting through the boxes, Audie was ready to get going on the project. Since Oishi was originally going to keep the car for himself, he had purchased all-new trim, NOS marker lights and exterior moldings. The parts were chrome plated by Alberto of Alberto’s Polishing. Before putting the car back together, Audie decided to ship it to Walt Prey, who gold leafed and pinstriped the entire car to accent the body lines. John Herrera of Monster Customs installed a chrome setup and helped fix the obstacle of the shaved gas door. As a final touch, Audie broke out new Premium Sportways 5.20s, which were mounted on new Dayton wires to give “Ruby” the look that he so much desired. With the help of his family and friends, Audie now owns two beautiful magazine-worthy cars, which just might be passed down to his two boys if they keep up their grades. Body/Paint: Duran’s Quality Painting in Baldwin Park, California, used Sikkens materials including jet black paint from start to finish. 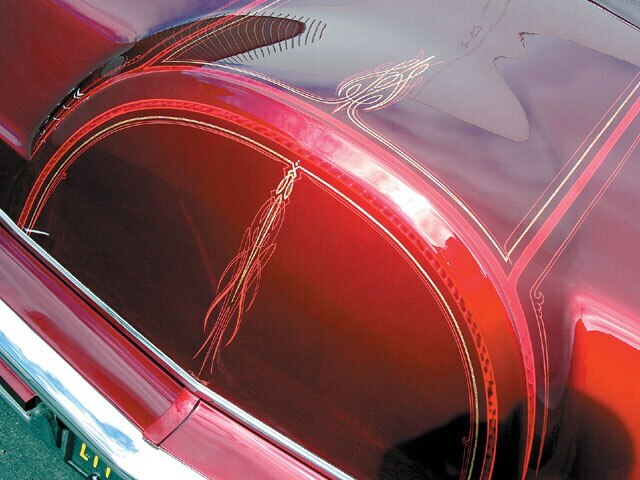 Walt Prey provided the pinstriping. Interior: E&J in Santa Fe Springs, California, tricked out the interior to give it a custom look without losing the elegance of the luxury vehicle. Sound System: Radio Loco in Montebello, California, wired a Kenwood head unit to 6.5-inch speakers and a pair of 12-inch woofers for bass. Setup: Two custom-built old school pumps were black nickel plated and hard-lined by Evergreen Hydraulics in Montebello. Body/Paint: Gary Baca of Van Nuys, California, broke out his famous secret dyes and mixed up the custom red paint. Walt Prey gold leafed and pinstriped the car to accent the body lines. 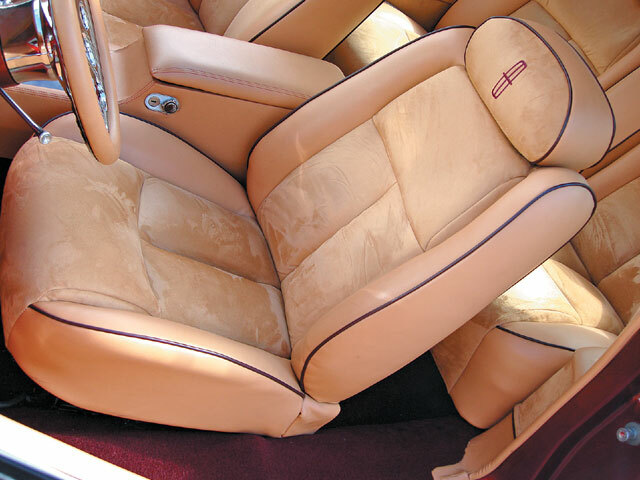 Interior: Some custom, some luxury, all clean. 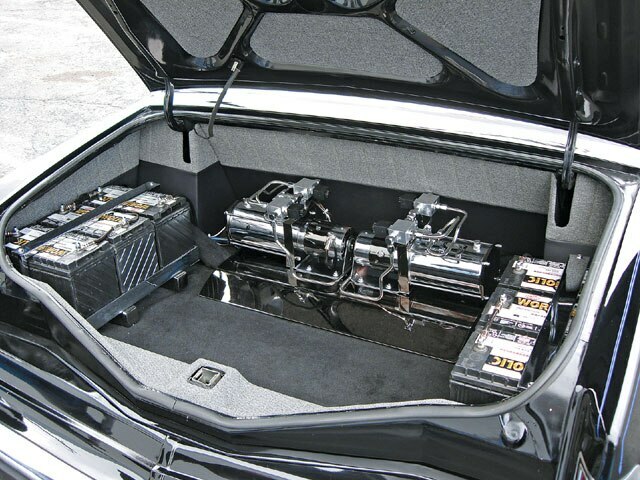 Sound System: A Kenwood flip-out head unit was wired to 6.5-inch speakers up front, 6x9s for rear fill and a pair of 10-inch woofers for bass. Setup: Two Pro Hopper chrome pumps, four dumps, 8-inch cylinders and four batteries bolted to the frame set up the old school hydros installed by John Herrera at Monster Customs in Baldwin Park.